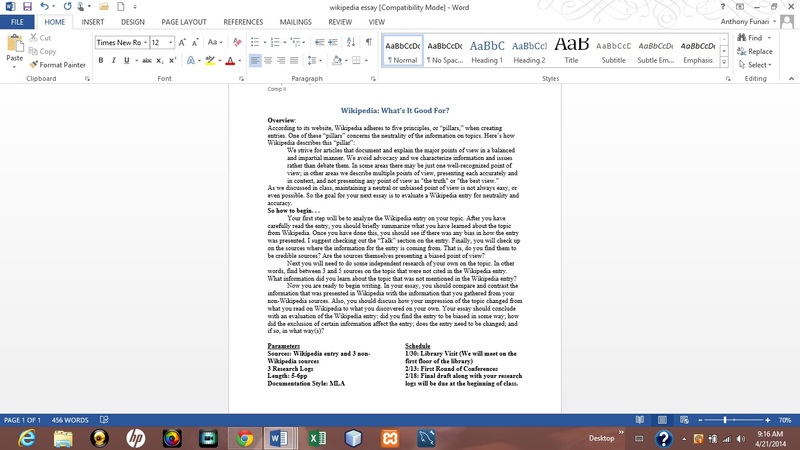 This week’s post is devoted to laying out the semester-long Wikipedia project. As with all facets of our courses, this project has and is very much evolving from its earliest version. Actually my Wikipedia project itself stems from a writing assignment that my then dean, Andy Anderson, recommended, which still holds a central place in the project. We strive for articles that document and explain the major points of view, giving due weight with respect to their prominence in an impartial tone. We avoid advocacy and we characterize information and issues rather than debate them. In some areas there may be just one well-recognized point of view; in others, we describe multiple points of view, presenting each accurately and in context rather than as “the truth” or “the best view”. All articles must strive for verifiable accuracy, citing reliable, authoritative sources, especially when the topic is controversial or is on living persons. Editors’ personal experiences, interpretations, or opinions do not belong. Step 2: Wikipedia, What’s it Good For? 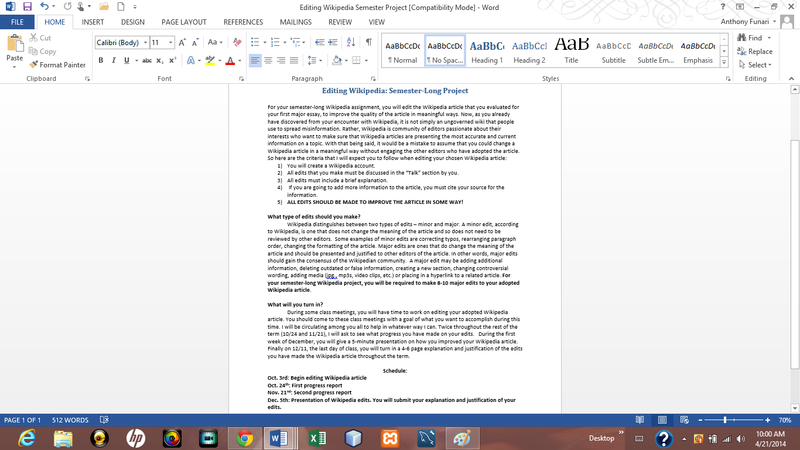 Once students have completed this part of the project, we have a class devoted to beginning editing their chosen Wikipedia article. Now there is quite a lot of content that I cover with my students in this class meeting, but the three major topics we deal with are 1) the parameters of the editing part of the project (I have image of the assignment sheet below), 2) the need to stay safe online, and 3) the user-interface for making edits on Wikipedia. At this point, students will have done some cursory research on their topic. Based on the research, they have a starting point to make some edits. Students can be resistant to this part of the project. A common complaint that students have voiced to me is that the article is “perfect” and does not need to be edited. When I encounter this response, I ask students to visit the “talk” section of the article to see what other editors have to say about the article. Sometimes doing so gives my students springboards for their edits. Another concern students have is that they are not experts in the topic and so have no right to edit the article. To this I like remind my students that Wikipedia is not for professionals or experts in the field – it is for those who care about the topic and want to ensure that the most accurate and neutral information is available. Further, I try to encourage them by pointing out that they do have a right to voice what they have learned through their research. My next post on the Wikipedia project will cover the progress reports and overall where I see the project being successful and where I would like to improve it.